Cigarette smoking increases the risk of serious cardiovascular events from combination oral contraceptives (COC) use. This risk increases with age, particularly in women over 35 years of age, and with the number of cigarettes smoked. For this reason, COCs should not be used by women who are over 35 years of age and smoke [see Contraindications (4) ]. 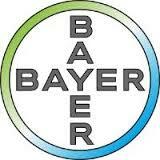 Safyral is indicated for use by women to prevent pregnancy. 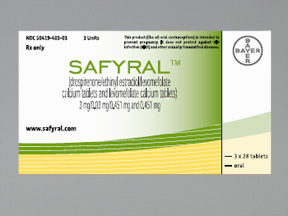 Safyral is indicated in women who choose to use an oral contraceptive as their method of contraception, to raise folate levels for the purpose of reducing the risk of a neural tube defect in a pregnancy conceived while taking the product or shortly after discontinuing the product. To achieve maximum contraceptive effectiveness, Safyral must be taken as directed, in the order directed on the blister pack. Single missed pills should be taken as soon as remembered. Instruct the patient to begin taking Safyral either on the first day of her menstrual period (Day 1 Start) or on the first Sunday after the onset of her menstrual period (Sunday Start). NDC 50419-0403-03 UPC/GTIN No.3-50419-40303-4 Mfg.Part No.40303 Y+ or M+ tablet , film-coated , multi-colored , round round Biconvex21 orange round tablets with a Y+" embossed in a hexagon; 7 l"